Starbucks‘ coffee shop marketing game plan is always on-point. Their seasonal promotions are always something to look forward to. And people are always excited for the release of their New Year cafe merchandise. 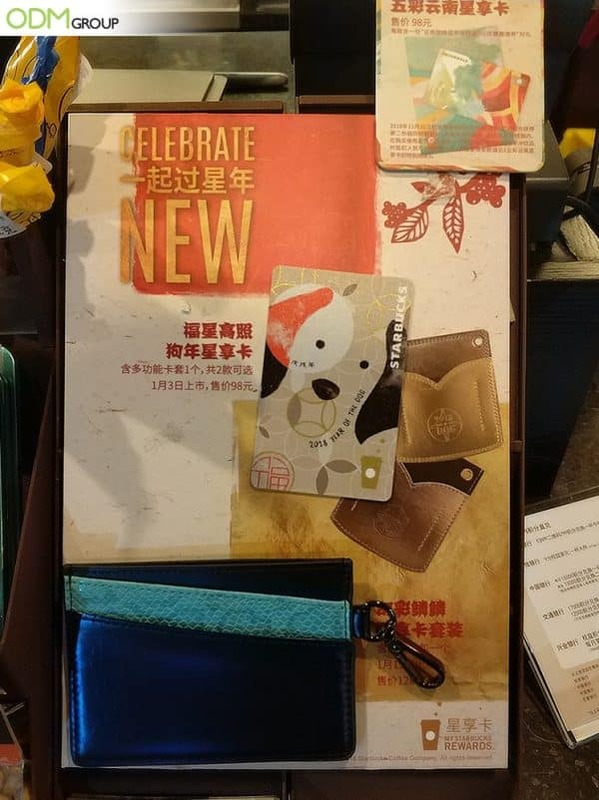 For the Year of the dog, the company offered exciting exclusive coffee shop merchandise which includes a Year of the Dog stored value card and card holder. 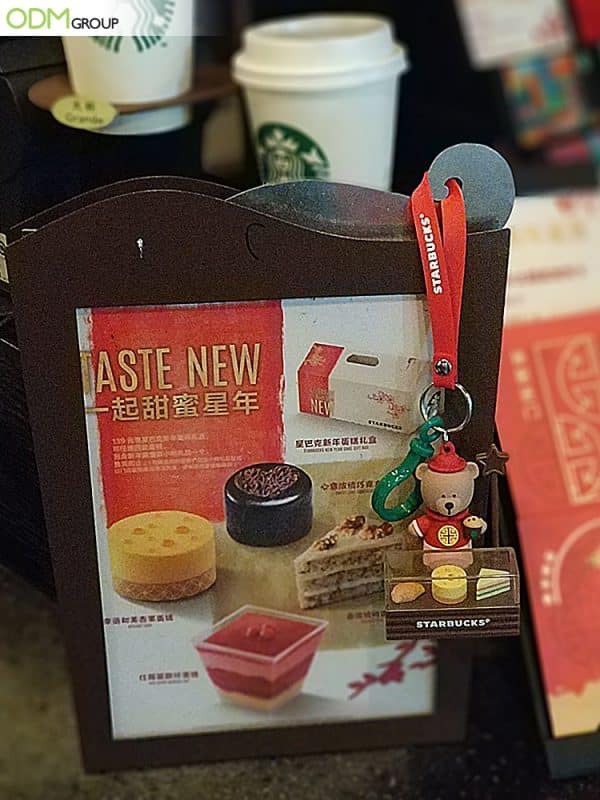 A Bearista Bear keychain is also being offered as a limited-edition CNY merch. Amazing line of promotional product for last year makes us even more excited for 2019 Year of the Pig! If you are just starting out in the business and are thinking of a brlliant coffee shop marketing plan, read on this blog to learn how Starbucks did it. Why Starbucks’ Coffee Shop Marketing Game Is Lit? Practicality: Their Year of the Dog card is definitely a great addition to their marketing scheme. This card is as good as cash- great for when they don’t have spare money left on their pockets to buy their favorite espresso. Stored value cards are a great way to add value to your brand. Plus, they make purchasing a breeze. Novelty: Limited-edition Bearista bear charms with cakes is remarkable. One look and people will instantly recognize the mascot. Their custom key chain design also effectively promote their special New Year sweets. Being limited-edition makes it a great collectible item, thus, adding more value to the brand. High Utility: The card holder is ideal for just about all card sizes. 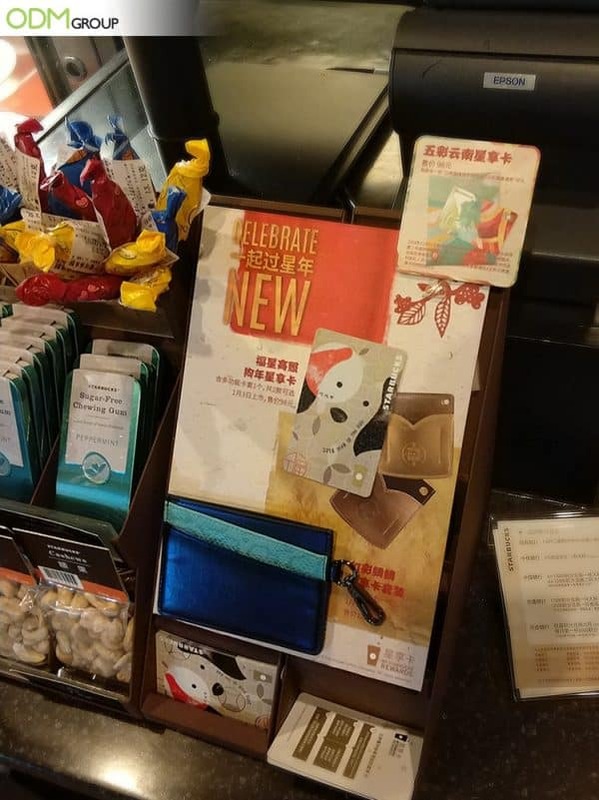 Customers can put in their credit cards or ID in there along with their Starbucks CNY card. Sleek design makes it ideal for any outing. This is a good idea to pair with their CNY card because business card holders are a fantastic way to spark conversations about your brand. Get your logo out there for more people to see! You can emboss or deboss the logo to make the branding longer-lasting. Counter Display: Items are advertised near the counter, which really helped in driving impulse purchase. This will entice customers to get add-ons thus, increasing sales. 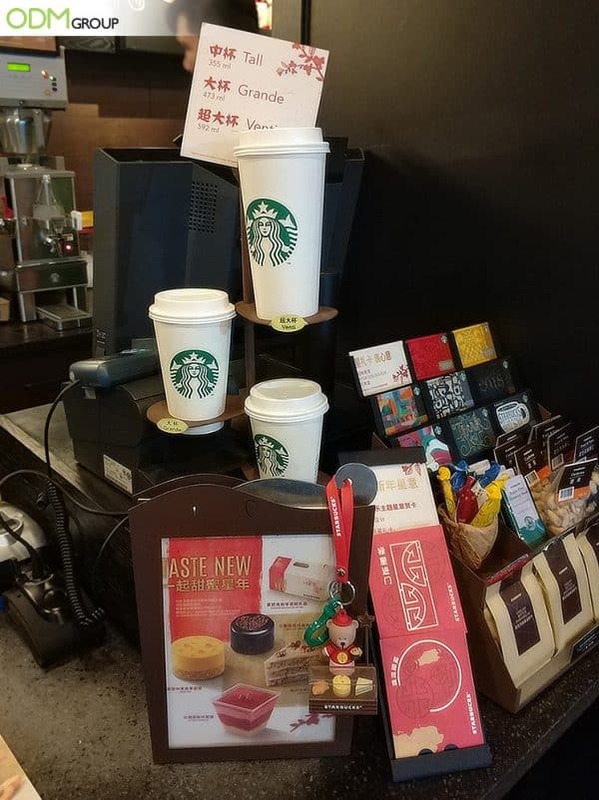 We really enjoyed Starbucks smart coffee shop marketing scheme. It’s effective and impactful. Plus, they designed their merchandise with their customers in mind. Now, we can’t wait for their Year of the Pig merch! Speaking of which, watch out for ODM’s new CNY Pig Socks. Planning to launch your coffee shop merchandise soon? If so, please speak with our marketing and design staff. Our ODM team can help you design, source, and manufacture promotional products to grow your brand. Speak with our merchandisers and product designers to know more about your promotional product options. We also work hard to deliver high quality retail POS displays and free standing display units. Send us an inquiry today! Need more coffee shop marketing ideas? We rounded some of our favorite blogs from the archives. Check them out. Starbucks collaborated with Alice + Olivia to create these cute-looking plushies. See why they’re effective. We can’t get enough of Starbucks cool merch!